QuickStart technology allows steam generation in about a minute. Maximum volume rating: 128 cu ft. Polished Brass finish. Power: 6kW, 240V, 25A. Integrated aroma steamhead reservoir for a scented steam experience. Add a few drops of your favorite fragrance and enjoy a refreshing, stimulating aroma therapy. 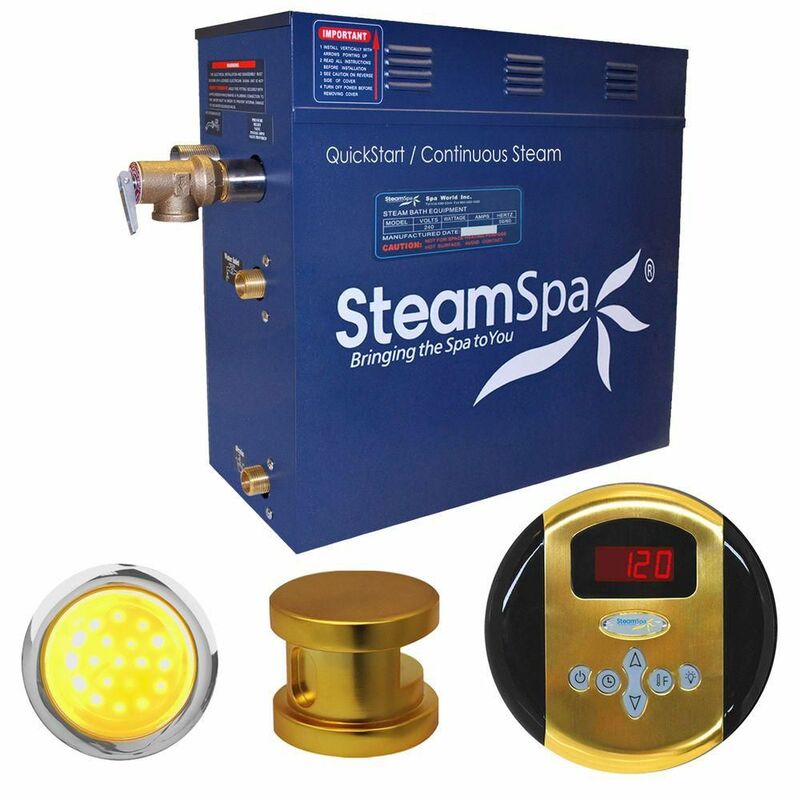 Indulgence 6kw Steam Generator Package in Polished Brass The perfect steam sauna experience is exactly what we had in mind with SteamSpa steam generator packages. Easy to install and even easier to operate these steam generators produce a consistent flow of soft and soothing steam thanks to the cleverly designed dual tank technology while minimizing any distracting operational noises. Compact in size and design they also feature the Auto Drain system that aids in making maintenance easier by purging the generator of any excess water/minerals that would later contribute to issues down the line. All in all you get a safe, quite, reliable, luxurious steam sauna experience with our compact powerhouse of a steam generator. Adding to the luxury empowered by the generator are the wonderful accessories included which will aid your relaxing steam experience in finishes creating a thoroughly holistic sauna decor.